As you suggest, pretty tight. That shows how insured unemployment gives you a stable Beveridge curve. So, I think one could make a case that "not tight at all" does not describe the state of the labor market. Damn tight would be more apt. Why the disconnect between openings and hires? Probably a tug of war about wages being offered. 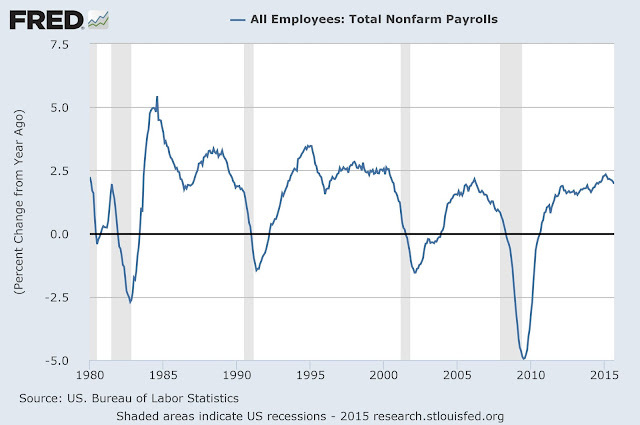 I can't remember what the number is, but a large fraction of hiring is job-to-job. 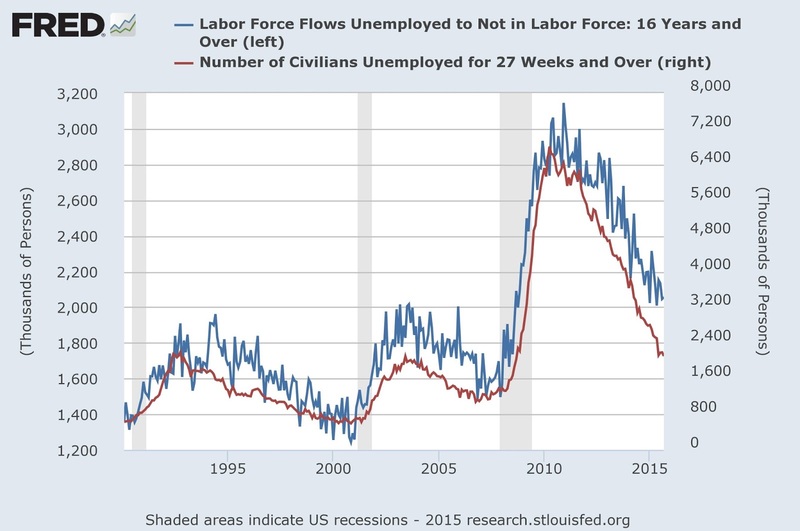 One unusual feature of the labor market currently, is that there is a lot less movement from job-to-job in the labor market, reflected in low hires and low quits. What we're interested in here are the flows among labor force states - employment, unemployed, NILF, and so it's not clear you want to be interpreting the ratio of openings/hires as reflecting lack of tightness. "Probably a tug of war about wages being offered." I got that idea from soaring job openings and stalled hires. This is a market that is failing to clear. 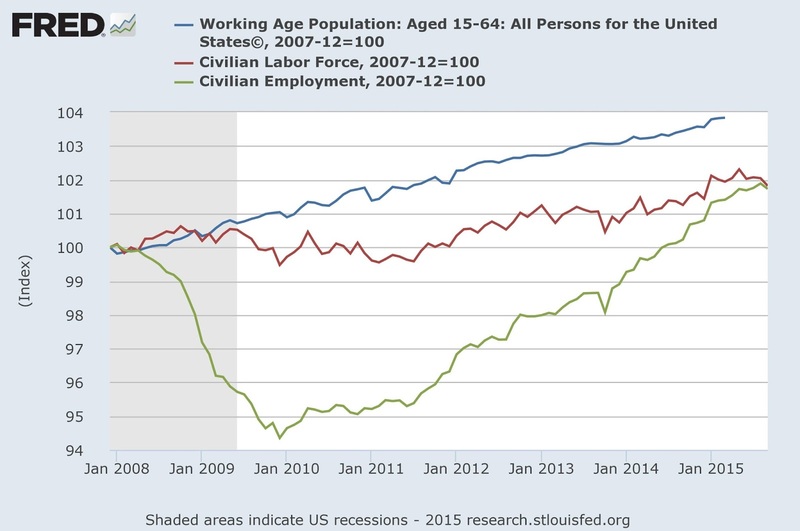 Part of the the point is that it's not useful to think of the labor market, and in particular this labor market, as a "market," in the econ 101 sense. There is heterogeneity, and friction. If the only friction you can think about is sticky wages and prices, you're not going to get very far in explaining what is going on. 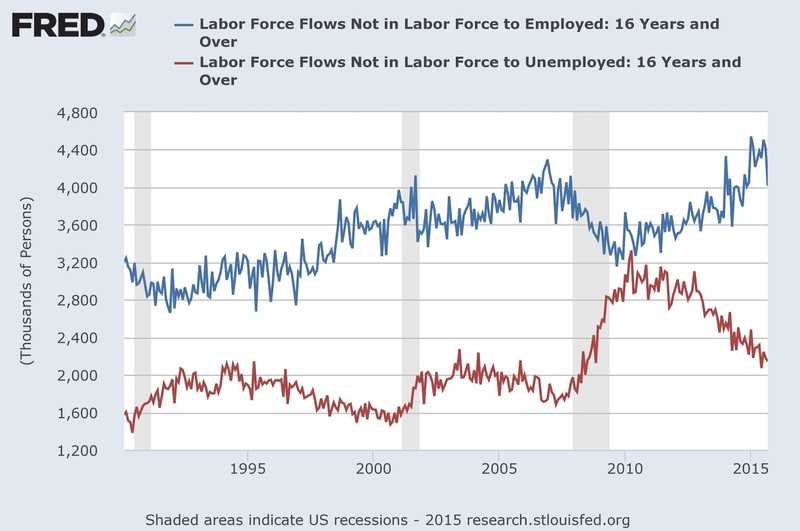 "These charts reinforce a view that the fall in labor force participation, post-recession, has been driven by long-run factors, and those factors show no sign of abating." One needs a story to suggest this topsy turvy result. 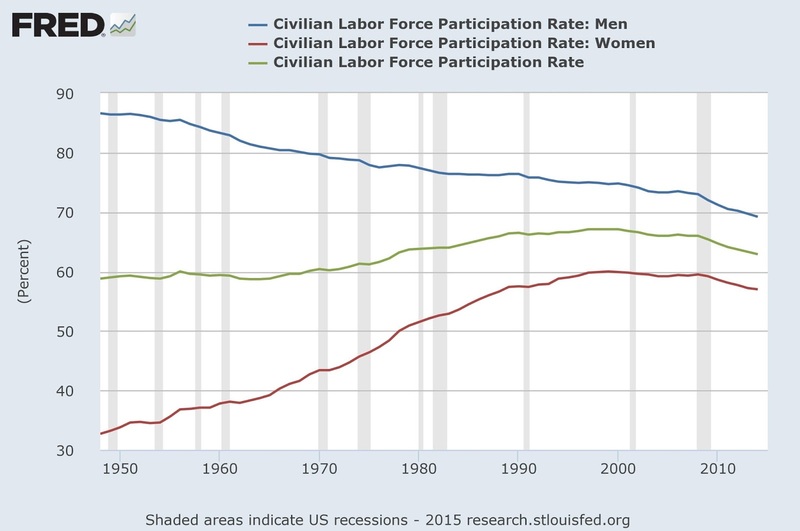 Else the coincidence of the decline in participation and the bubble burst is too powerful. "One needs a story to suggest this topsy turvy result." 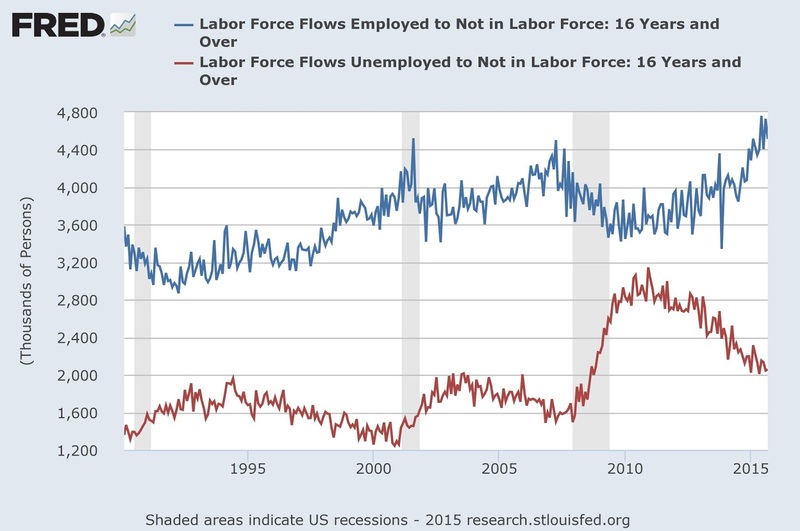 In the past, labor force participation has not been cyclically sensitive, and in this case labor force participation is falling while unemployment is falling at a high rate. So what else could this be but long run factors driving a decrease in labor force participation? If this has something to do with a "bubble burst" why wouldn't this be accompanied by a persistently high unemployment rate? As well, look at the second-to-last chart. There is a large flow of people currently transiting directly from employment to NILF. They are doing that because a bubble burst 9 years previously? I'm afraid I'm not smart enough to say what effects a gap down in demand should have in all its details. But I can say that clearly world governments did not due the job necessary to adequately replace demand. Where a large part of what was required was to in a sense "feed" real capital assets with demand so managers would not abandon them. So I cannot say what the second to last chart means in this context. Perhaps someone else can. In addition to the towering Coincidence, we have seen a parade of economists' efforts to justify, explain, normalize our miserable condition, starting perhaps with Summers, all seeking to recast the Coincidence as an inevitable long term trend. If because of our persistent action (or inaction) we manage to establish a new equilibrium, ex post this does not mean it is what had to happen. All of the words in john's post individually mean something, but collectively they mean nothing. 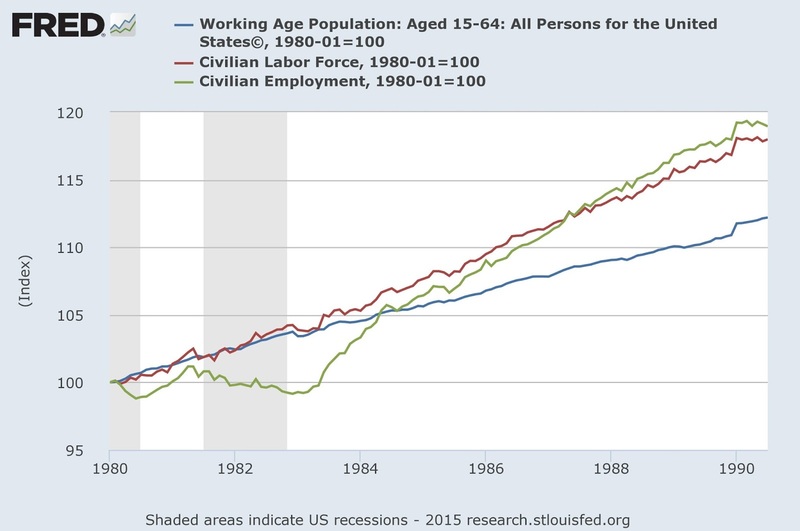 A more recent graph would be nice but stagnant wages for a portion of the population with rising childcare costs could cut the LFPR of a certain age group in this manner- speculation only at this point. I don't know the data that well, but there's certainly more detail in there by gender and age. I do know that labor force participation has not fallen in Canada. Demographics are similar in Canada, but of course social services are quite different. There may be tax deductions for child care costs as well. One of my labor economist colleagues tells me there are interesting things going on with respect to fertility, particularly as regards college-educated women. 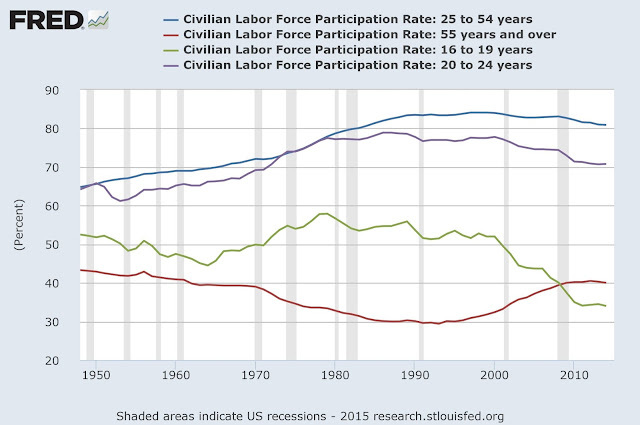 Like Canada, UK labour force participation is strong, rising even. And, like Canada, the UK has similar demographics to the US. It's a mysterious world.